It's true, I LOVE pompoms! There, I said it, and now it is in writing, although I am sure this comes as NO surprise to anyone who knows me, or anyone who has seen me, or has stepped into my house! In fact, during one marathon pompom making session here at Factory 506, my friend Shane named my patio table "The Pompomery"! I love it, and the term has stuck. I have been making, finding and buying pompoms for more years than I can remember. I may or may not have even gotten some of the neighborhood crafting wizards in on this affliction hobby! I most likely have a serious problem, but it is one of those harmless issues that keeps me happy. Pompoms make me happy, very happy! In fact, they make me so happy that I am declaring this week, POMPOM WEEK!!! Let's begin with the latest batch from the Pompomery! 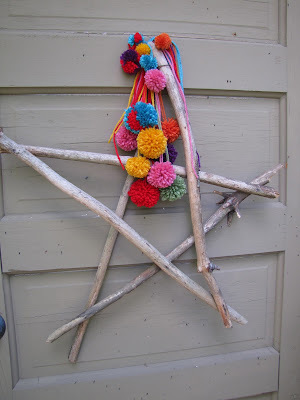 I love how my stick star looks all dressed in pompoms! It is super easy to make pompoms. 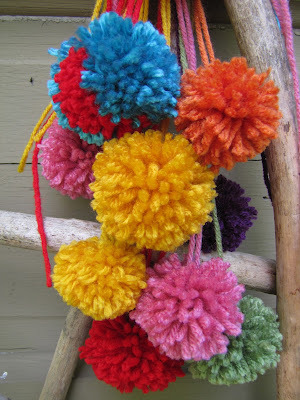 You can make them by hand with just a bunch of yarn or you can buy a pompom maker, better yet, a set of pompom makers in all different sizes. I make them by hand and with a pompom maker. And they are all fabulous! Through much careful research here at the pompomery, we have found that a pompom maker will give you a fatter and "meatier" pompom and making them by hand will give you a cute pompom that looks a little more like fireworks. Same pompom shape, just not as fat. The pompom on the left was made with the pompom maker and the one on the right was made by just wrapping yarn around my hand. Obviously, both are awesome, just a little bit different. I have a friend who makes her pompoms by using two circles cut out of cardboard. 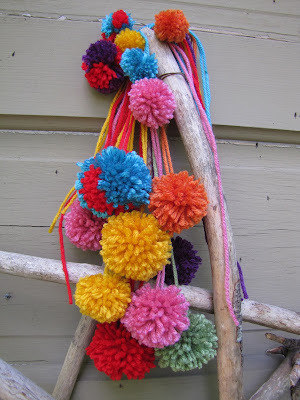 What ever the method, it's very fast and easy to make pompoms. And guess what? There are about 10 million things that you can do with your pompoms. Don't worry, we'll get into that later this week! Have you ever made a pompom? If so, what did you do with them, I would love to know! Should I give "How To" instructions tomorrow?